Severe winter storms across much of the country in January caused work stoppages for hundreds of thousands of individuals, negatively impacting employment growth for the month. Total nonfarm payrolls increased by just 36,000 jobs, reflecting a 72 percent decline from the average over the previous three months. Absent weather issues, job creation for January had been forecast to approach 200,000 positions. Sectors most affected by the storms included transportation and utilities, construction, and leisure and hospitality, which accounted for a combined loss of 75,000 jobs. On a positive note, manufacturing, retail trade, and professional and business services posted healthy gains, suggesting the recovery remains intact. 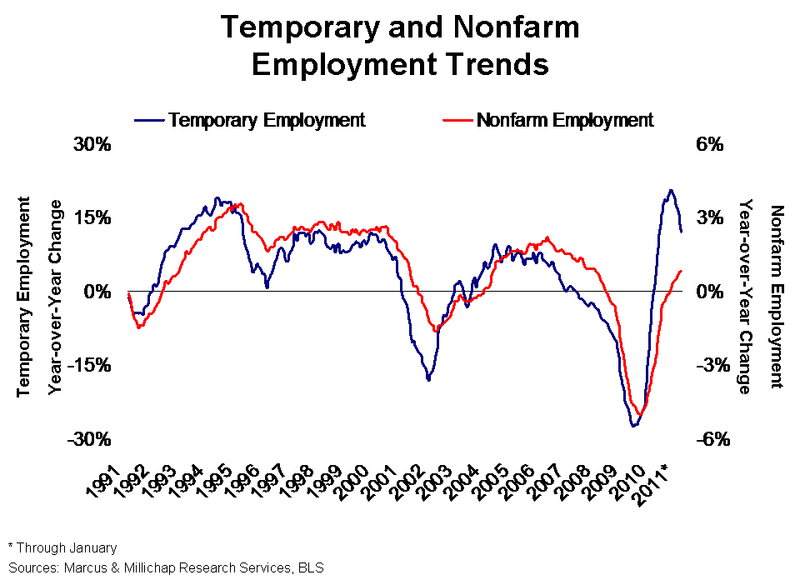 Furthermore, growth in the professional and business services sector has largely transitioned to permanent hiring rather than temporary staffing, possibly signaling easing corporate caution. A reduction in the size of the labor force last month generated a 40 basis point decline in the unemployment rate to 9 percent, the lowest level since April 2009. While the sharp decrease in unemployment has been greeted as a positive trend, the labor force contraction may largely reflect statistical influences common at the beginning of the year. Adjustments to population figures, seasonal factors and modeling complexities during periods of economic transition like the current recovery may have converged to generate the steep drop. Anticipated revisions in the coming months may ease the significance of the unemployment decline. The January employment report re-benchmarked historical data, indicating that the contraction was deeper and more prolonged than originally believed. Revised figures show the nation lost 8.75 million jobs during the downturn, up from the previously reported total of 8.36 million positions. The new data also revealed the nation continued to shed jobs through February 2010, a few months beyond what was first reported. As a result, total nonfarm employment growth last year reached just 909,000 positions, 215,000 jobs less than the previously released total. These downward revisions reiterate the challenges the economy will face as it rebuilds. The retail sector continued to expand post-holiday season, picking up 27,500 jobs in January. The early 2011 acceleration in retail employment growth reflects a stronger-than-expected showing among consumers, with some of the most significant gains reported in nonessential segments, such as clothing and building materials/garden supply stores. Despite these encouraging trends, the retail market remains highly bifurcated, with major national chains reporting strong results and many smaller retailers continuing to struggle. As a result, anchored shopping centers in prime locations will outperform again this year as strip centers in secondary/tertiary areas remain weak. Pressure from these opposing forces will limit improvements in fundamentals, with the vacancy rate forecast to retreat just 20 basis points in 2011 to 9.8 percent. Individuals aged 20 to 34 will continue to account for the majority of job growth in 2011. During 2010, this prime renter cohort accounted for nearly two-thirds of the new positions, which, combined with the release of pent-up renter demand, contributed to a surge in apartment absorption. With this employment trend expected to persist in 2011, apartment vacancy will retreat 110 basis points to 5.6 percent, reaching pre-recession levels well ahead of expectations. A second year of strong occupancy gains will support effective rent growth of 4.5 percent. This entry was written by marcusmillichap, posted on February 11, 2011 at 12:33 am, filed under Research and tagged Employment. Bookmark the permalink. Follow any comments here with the RSS feed for this post. Trackbacks are closed, but you can post a comment.